I’ve found a way to make delicious homemade Artisan Bread in 5 Minutes a Day. It’s so easy, this bread almost makes itself! I think it’s time I tell you………. My husband has an addiction. An addiction to bread. Not just any bread, but good homemade bread. And I’ve never been good about making it for him. I got rid of my bread machine a few years ago, because it was just too big and was taking up valuable space, for how little I used it. I would occasionally buy the loaves you find in the freezer section of your grocery store, that you just put in a pan to rise then bake. Those are good, but it’s just not the same as making your own. Yeast can be intimidating. It’s particular. It usually involves kneading, rising, fussing, and time! You have to worry about temperature and humidity. All very different than my affair with sugar. Sugar is easy going and rarely lets me down. Yeast, on the other hand, is usually a little “high maintenance for me”. I could live with the fact that would never own title of “bread maker”. Naturally, I was intrigued several weeks ago when Kristen mentioned she made the easiest loaf of bread. EVER! 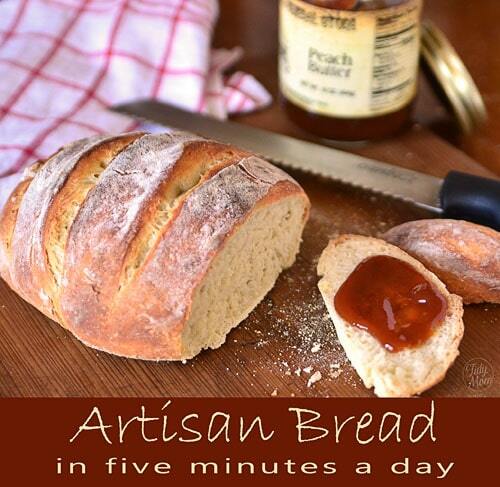 Artisan Bread in Five Minutes a Day. Mix 4 ingredients in a bowl with a wooden spoon! That’s it! Cover and let it sit and rise for about 2 hours (no babysitting required). 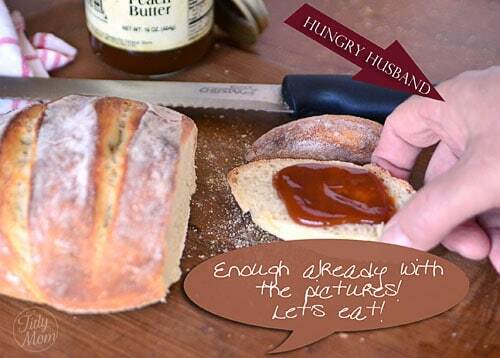 Then pop in the fridge and cut off a big chunk when you are craving a warm hearty loaf. It’s that easy. The dough can keep in the fridge up to two weeks, and the longer it stays in the refrigerator, the more flavorful it becomes and the larger the air holes will be in the loaf. But I have to say, I haven’t had the chance to experience that yet, as we have been making a loaf nearly every other day for the last two weeks. Yeah, it’s THAT good! The day you want to make your bread, it’s just five minutes of active effort (hence the name 5 minutes a day). You cut off about one pound of dough (you can get about 3 loaves out of one recipe) shape it, let it rest for 40 minutes, add a few pretty slashes to the top and throw it in the oven for 30 minutes. Can’t get any easier than that! TidyDad is begging for bread each day. He can hardly wait for it to cool after it comes out of the oven (or for me to get a picture) – you should let the bread cool before slicing. This has really rocked our world!! You can follow the recipe and instructions at ArtisanBreadinFive.com or you can buy the book for even more recipes using this basic dough. whiskers, camo and ALL! HA! 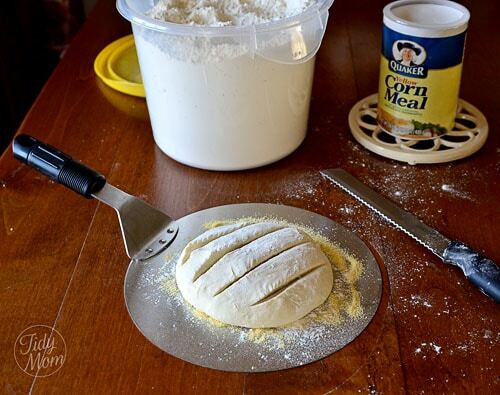 Do you make homemade bread? 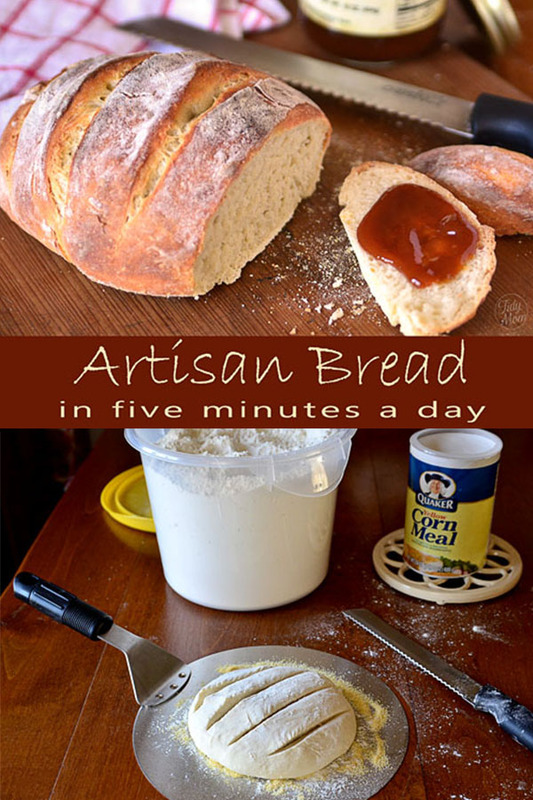 Goodlife Eats has a printable version of the basic Artisan Bread in Five Recipe. Note, that she used Whole Wheat flour, but the original recipe only calls for 6-1/2 cups unbleached white flour only, and she shaped her dough for baguettes. 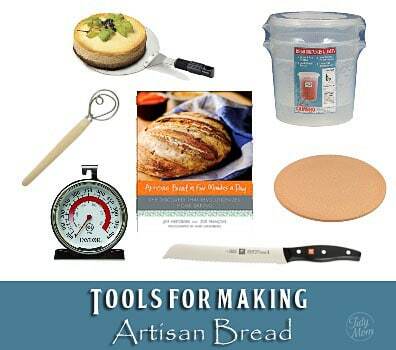 Make and Takes has a great post with step by step pictures making Artisan Bread in Five the same way I make it. Like this Homemade Artisan Bread?! Pin It! Thanks so much for sharing this! I’ve always wanted to bake my own bread, but was too intimidated to try. You always hear how finicky and picky bread dough is and that you have make it “just so” or the world will end… After reading the five minutes a day info though, I know I can make it! I’m already getting giddy thinking about the smell of fresh baked bread in the house. Wowza is that a beautiful loaf of bread!! LOVE the photo of hubs too! I rarely comment on blogs but today I decided to . 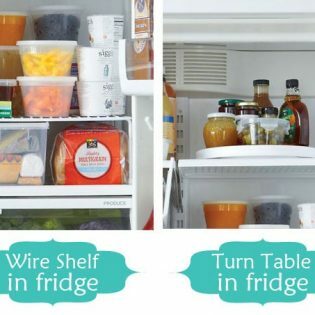 You share a piece of yourself along with delicious recepies in every post. Today I feel like I should share a piece of me. My name is Kessie and I’m 25 years old. I’m hardworking, I’ve been engaged for 4 months to the most wonderful man any woman could ask for, and I’m a recovering drug-addict. When I went into recovery I discovered I had a knack for cooking and I began reading cooking blogs, such as yours, to fuel my new hobby. By the time I got help I had burned all my bridges and only had myself. Cooking became my way of expressing myself. Of being Me. I’m not trying to be mean, but you don’t know all of your readers and there are certain things you shouldn’t be so trivial with. Addiction is something that effects almost every family and is a very sensitive subject for some people. 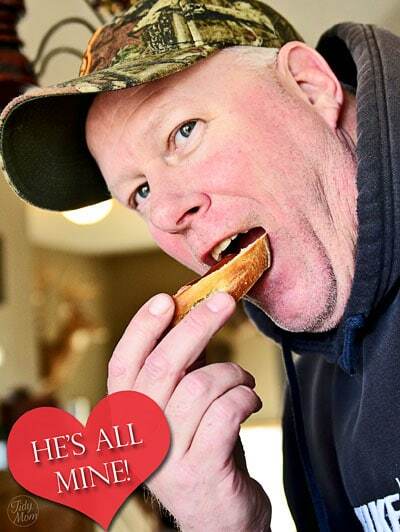 I’m sure you’re very nice in person & your husband looks just as delicious as the bread he’s eating. If I were you I’d keep a tight hold on him! I love the sound of this, I love the smell of bread baking. I just discovered this recipe over the holidays. I also like the recipe for “naan”. No rest time when you get it out of the oven – preheat your cast-iron skillet till water skitters across it. Put about 1/2 – 1 tablespoon oil in, stretch 4 oz dough into a small piza crust. Put in skillet, cover. Cook about 3 min, then flip over and repeat. Sooooo good! I also do quick pizzas this way – after I flip it the first time, I sauce and cheese that side. I think e official directions are on the ABin5 website. Hurrah, for quick, homemade bread. And, I agree, that’s such a great book! Oh my goodness I LOVE bread, yours looks wonderful! My hubby would be trying to sneak a piece too. 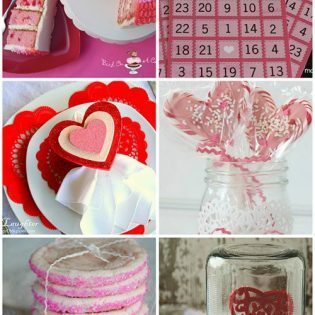 Great list of “lovin it” going on! Oh, so do I!! Nothing beats fresh, warm bread, butter and jam!! Warm homemade bread out of the oven definitely has a similar effect on me, so hard to resist! I don’t make homemade bread often (except for gluten-free), but I know my kids who are not on a gluten-free diet would love this one. Love how simple this is. That bread looks fabulous! I’ve never actually tried the ABin5 recipe, but I do love homemade bread. I think I will have to give it a shot this winter! Pingback: Baked Pumpkin Pie Oatmeal » The Misadventures of Mrs B. In this way, you guys receive the Microsoft Points for free of charge with little to no work. craftsmanship. While you are searching, be sure to use legitimate sites to acquire the codes.